Hot on the heels of their Teeling Single Cask, online German whiskey retailer, Irish Whiskeys, has released another exclusive bottling. This is a single cask, single malt, triple-distilled in 2001 at a distillery in Northern Ireland (more we are not permitted to say). It was matured in a bourbon hogshead and bottled at 51%. There are only 120 bottles, €79.90 a pop. 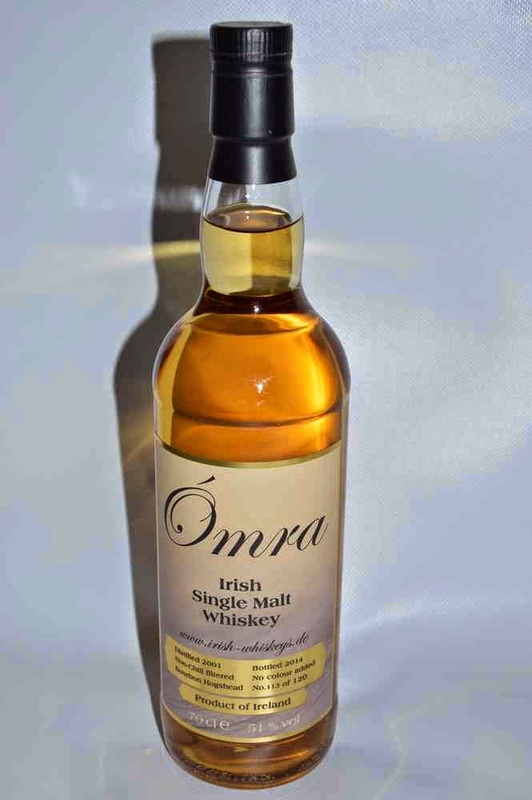 It has been christened "Ómra" which, I have just learned, means "amber" in Irish. As well as shipping to various continental European countries, owner Mareike Spitzer tells me they now ship to Ireland too. Welcome news! Ripe fruit, hazelnut, vanilla, toffee, sherry sweetness.